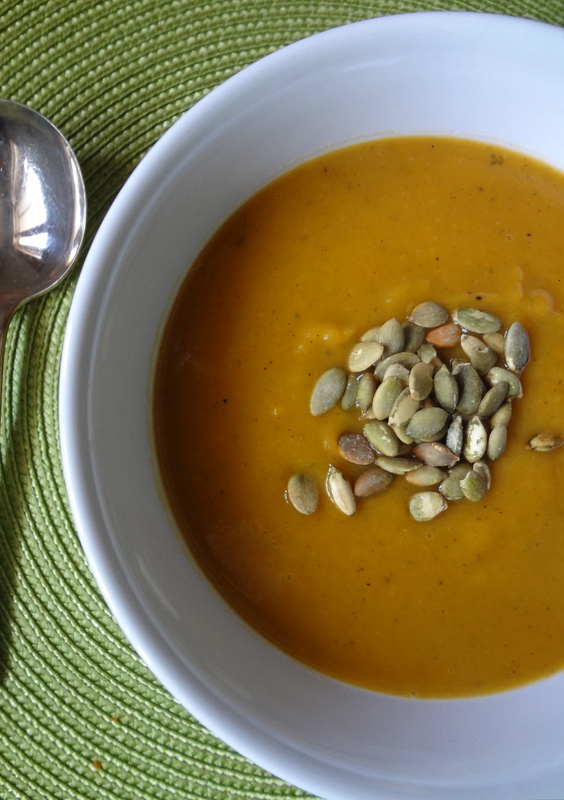 Because butternut squash is like vegetable candy. Bake it, roast it, and you’ve got a magical little veggie that brings Autumn to your table.Peeling and chopping nightmares aside, butternut squash is pretty versatile. You can bake it, stuff it, puree it, put it in stews, risottos…got those culinary juices flowing? Good. Now try this soup! It’s incredibly simple to make, if you have a blender, and has a deliciously creamy consistency that is so comforting on a chilly fall day. And you can modify it any number of ways! Top it with pepitas (like I did), or whip up some spiced sour cream, add fresh herbs, candied pecans, whatever does the trick for your tongue. I mean, you weren’t really planning on going outside in the sleet, where you? 1. Heat your oven to 400 degrees. Chop the top off the head of garlic so all the cloves are exposed and drizzle with 1/2 tsp. of olive oil. Add a dash of salt and pepper, wrap in aluminium foil and roast in the oven for about 40 minutes, or until the cloves are tender. 2. Toss your butternut squash in 2 tsp. of olive oil and season with salt and pepper. Lay the squash in a single layer in a greased baking sheet, and roast with the garlic for about 20 minutes, or until a fork easily pierces the largest pieces of squash. 3. Once the garlic and squash have finished roasting, toss them in a blender with some diced apple and chicken/veggie stock. Blend until liquified, and repeat with as many batches as necessary, pouring each batch into a large stock pan. 4. Heat the soup over medium-high heat until you get the desired consistency. Add more stock to thin it out, cook off more liquid to get a thicker soup. 5. Top with pepitas, candied pecans, spiced cream, or anything else your little heart desires! 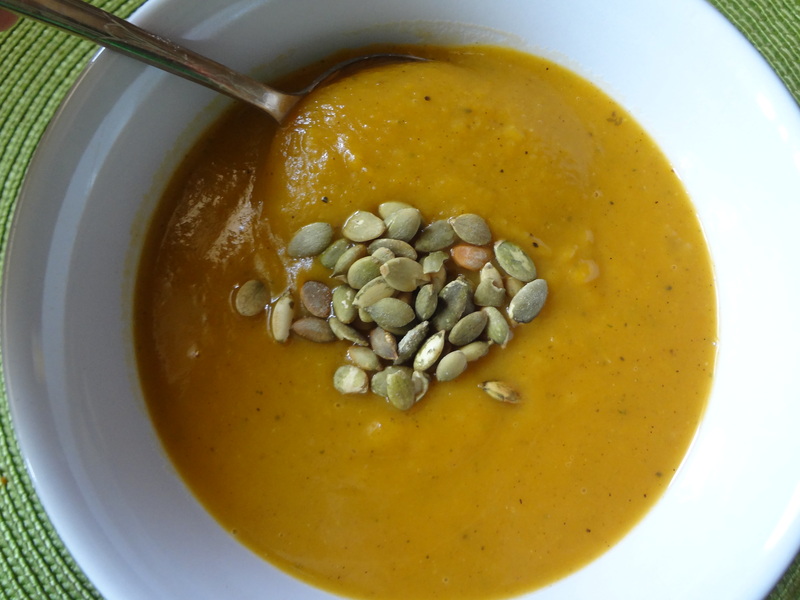 This entry was posted in Uncategorized and tagged Appetizer, apple, blender soup, Butternut Squash, creamy, fall, fast and easy, Garlic, Make ahead, roasted, shallot, soup by theculinarycapers. Bookmark the permalink.